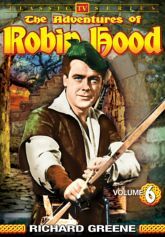 The legend of Robin Hood is given a grand retelling in this long running television series (1955-58). Filmed in Great Britain with the handsome and dashing Richard Greene as Robin, the "outlaws" of Sherwood Forest watch over the people of England and protect them from the cruelty and greed of the ruling aristocrats. Hubert: A clumsy, hapless knight enters Sherwood Forest and demands the aid of Robin Hood. His true love is betrothed to a lord who is only after the girl's dowry. Robin is unwilling to get involved in matters of the heart, but when he discovers that the lord intends to use the gold to aid Prince John, he vows to put a stop to the marriage. My Brother's Keeper: Two knights (brothers) couldn't be more different in spirit. In a fit of jealousy, the evil brother murders his virtuous sibling. Little John and Robin are the only witnesses to the crime and they hatch an ingenious plot to confront the killer and bring him to justice. An Apple for the Archer: A young man stands to lose his true love's heart to a French suitor unless he can beat the foreigner in an archery contest. His disdain for the sport assures his defeat, but Robin Hood is determined to teach him the art of the bow and make a victor out of him. The Sheriff's Boots: In a small village, the Sheriff of Nottingham discovers the finest boots he's ever worn. Unbeknownst to him, the leather for the boots is made by Robin and his Merry Men. When the merchants of Nottingham demand the secret of the leather, they instigate a trade war that pits village against city, outlaw against tyrant.